A Business Without a Mobile App. You Must Be Kidding! Home / A Business Without a Mobile App. You Must Be Kidding! Mobile is our present. It has become an integral part of our every day lives. Mobile technology has witnessed unprecedented growth in the recent years. There are over 6.88 billion people who use mobile phones – that’s roughly 87% of the World’s population (Source: Wikipedia). In 2020, mobile data traffic worldwide is expected to reach 30.6 exabytes per month at a compound annual growth rate of 53 percent. The figures speaks volume of the prosperity of mobile technology in this era. Impact of mobile technology is such that people are used to the presence of mobility in all areas of their lives, and without doubt, this dependence will only grow immensely in the future. Consequently, a website is not enough for a business anymore. Mobile apps are the in-thing in today’s market. Active consumers are now on the move; from desktop browsers to easy-to-use mobile apps. Thus, the success in business one aims for needs trends compliance and the ability to meet the demands of modern customers. Currently, we are at the beginning of a transition; from browsing the Web on personal computers to mobile devices. This change is going to have a big impact on every industry, as the transition happening at an astonishing speed. The mobile app no longer remains a luxury, but a necessity in the modern business world. You must have an impressive online presence, irrespective of the nature and size of your business. 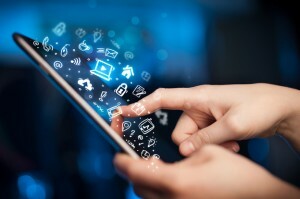 Experts say that businesses and entrepreneurs need to invest to develop amazing mobile apps. Let’s see why so? Modern users depend on mobile devices in all their daily activities on a constant basis. Mobile apps powers your business to be in touch with customers in a user-friendly environment, anywhere and at any time. Your brand and business gets the much needed exposure even with a simple viewing or regular usage of your application. Interaction with your business in possible while the customers are on the move. An app gives a brand an opportunity to create a relationship with the customers. It is like placing your brand or business close to your consumers, say in their pockets. A mobile application allows you to deliver personalized content that is relevant to the individual consumer. This is possible as the apps allow easy capture of information on customer preferences. You can track their action, collect data and analyze the same with ease. This is inexpensive and less time consuming. It’s not just about placing of orders online, but they can access information of the account, activity of the account, track the recent sales, recent orders, past orders, track orders, etc. Garnering of data with ease empowers the consumers, and brings a sense of trust in the brand, adds accountability, and shows your care for your customers. Once they trust your business, don’t disappoint them. Market segmentation through mobile app is possible as you can capture data from users accessing the application. Brand perception in the market and consumer point of view helps understand the areas your business needs improvement. Once you get the pulse of the market, grip on consumer’s taste then you can showcase your product in the market in a structured manner with ample confidence. A good mobile app hence becomes a crucial tool for market segmentation and analysis. Business owner can leverage from fantastic business benefits with the increasing usage of mobile apps. Youngsters rely more on their mobile devices than on traditional PC computers. They are the largest segment of smartphone owners, hence play a major role to promote your business. A mobile app, therefore is crucial to reach the vast audience. Old-fashioned techniques to promote business don’t work as good as mobile application do with young audience with smart phones. Smartphones have become the novel tool for browsing and buying goods and services online, and talking with families and friends,. To reach these viewers, a mobile app is a must have tool. Passion for social media sites is huge. Your app can aid your business increase its social standing by adding of the most popular social features such as comments, likes, shares, in-app messaging. Facebook, Twitter and Instagram where most of the social media traffic exists. Thus, consumers or prospective buyers will more and more time in your mobile app, if it provides them whole features they get into social media means. Popularity of a brand, product or services on social media increase its social standing , and sends a positive message among existing clients and future prospects. Popularity witnesses a major jump if posts and shares go viral. It’s also works an On-The-Go Advertising campaign. Money and time are critical aspects of every business. A well-designed app can save you both. A well-designed app can help users find solutions to simple issues that they usually struggle with. Customers, irrespective of where they are, get a channel to connect with your business at any time, from any where. They can access to a help desk, have personal calls with sales people, or opt for live chat, etc. Many help desk staff aren’t required in such scenario thereby reducing costs. The app results in a higher level of engagement with your brand by providing all the necessary information a customer needs on your company and products instantly. If your business doesn’t have a mobile app, you are already behind your competitors. It is suicidal not to invest in mobile app development with a thriving mobile industry. You need to make up for the lost of time and opportunities, and make up asap. An amazing mobile app is all your business needs right now! Thank you so much very nice post………………..
UBN Software Solutions Pvt. Ltd.